Microbial growth media and other liquids used for working with microbes must be sterilized to prevent contaminants from growing in them. The most effictive way to sterilize liquids is to heat them in an autoclave or a pressure cooker. But in some cases-especially for media with at least 10% salt-boiling is sufficient. Read on for details. Use an autoclave on liquid cycle if one is available. Autoclaves vary, so be sure to follow the instructions for your model. For agar-based media with 15% or more salt, you may need to cook for 20-25 min to completely dissolve the agar. 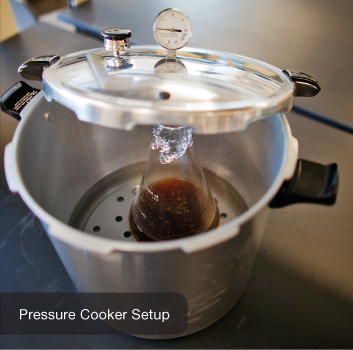 A pressure cooker works just as well as autoclaving, especially for small batches. Just like an autoclave, the pressure cooker chamber reaches temperatures high enough to kill bacteria and mold spores. Add an inch or two (2-5 cm) of water to the pressure cooker. Set your containers inside, on top of something that raises them slightly off the bottom (glass containers may crack if they sit directly on the bottom). Following the manufacturer&apos;s instructions, seal the pressure cooker and heat it on a burner. Stove burners, electric fifth burners, or kitchen hot plates tend to heat pressure cookers more quickly than than laboratory hot plates do. Keep at 15 psi for at least 15 min. For media with 15% or more salt, you may need to cook for 5-10 minutes longer to completely dissolve the agar. Remove the pressure cooker from the heat source and let the pressure gradually decrease on its own. if you remove the weight from the steam vent, the liquids will boil over. You can sterilize microbial growth media containing at least 10% salt by boiling on a hot plate, on a stovetop, or in a microwave. Use a hot plate with a magnetic stirrer if one is available. A stir bar will prevent ingredients from settling and burning on the bottom of the container, as well as sudden boil-overs. Cover your container. If you are using a microwave, cover your container with plastic wrap, and make a small hole in the opening to allow steam to escape. If you are using a hot plate or stovetop, cover your container loosely with aluminum foil. To ensure that the media is properly sterilized, boil it for at least 15 minutes. Tip: Sterilize water by placing a water-filled bottle (with the cap on loosely) in a boiling water bath for 15 minutes. Place something under the bottle so it does not directly contact the bottom of the pot. The containers in the photo below are sitting on top of metal canning rings. CAUTION: Agar-based media tends to foam easily and suddenly, so watch it carefully. Swirl often to mix until all ingredients are dissolved. Use thick oven mitts to help protect your hands from a potential boil-over.